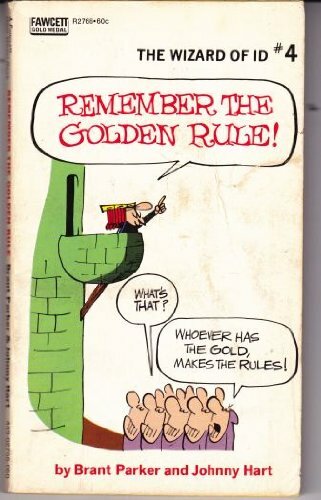 I finally decided to look up the source of the Golden Rule. Not the rule of reciprocity, which has its roots in antiquity all over the world – the sarcastic and cynical one. "Whoever has the gold, makes the rules." I didn't know that it came from the comic strip The Wizard of Id. I've been cynically quoting that for years, never knowing exactly where it came from. Thanks, Wikipedia. The quote never fails to get a reaction because, like most things we think are funny, it contains a grain of truth. Everyone in business, from the sole proprietor to an executive of a massive multinational corporation, has a boss. They determine whether or not you succeed, get paid, or continue to stay employed. If the people who define the metrics for measuring your success aren't bought into why you're doing what you're doing, you will have a problem. If one of you is wrong or simply not in agreement, it is your responsibility to address the discrepancy. Otherwise you may find yourself on the receiving end of a bad performance review or looking for a new job. If you truly have the freedom to tell your boss to pound sand, you are in an enviable but potentially dangerous position. Enviable since you have the freedom to do as you like; potentially dangerous since you have the freedom to do as you like, even when it's the wrong thing. Comply – do what's being asked of you. It may be a way to build trust and credibility. Once you're able to show that you're dependable and can get things done, you may earn more responsibility and opportunity to spread your wings a bit more. If this is your only option, it may also be a sign that the culture you're in is far from ideal. Convert – get them to see your side and support your point of view. If your situation, culture, information/data, and rhetorical abilities put you in a position to be able to change their minds, this is definitely an approach worth pursuing. If you're supposed to be the expert, this may simply be part of the job. Compromise – this is often a healthy approach and requires a meeting of the minds and empathy for each other's positions. You can't compromise without a conversation, and often that's just what's missing. It's amazing how many things are missed or misinterpreted only because the parties didn't talk to each other. I've been in a few situations where my boss and I didn't necessarily agree on what I was supposed to be doing. I've employed each of the approaches above with varying levels of success. What isn't healthy is to say one thing but do another. You can't say you'll comply or compromise but decide to go ahead with what you wanted to do anyway. Or convert someone and then change your mind without telling them. Seems obvious, but I've seen some amazing stuff done in the name of corporate politics. Sometimes, though, it's worth remembering that the quote is really just good for a laugh.